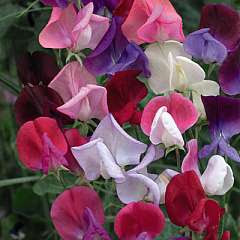 Sweet peas are just about my favourite garden flower, the range of colours, intensive perfume and growability all meet my requirements. Over the years I've experimented with various mixes, bought individual seeds from specialist nurseries and taken pot luck with supermarket bargains. This time I think I've just about reached perfection with a Thompson and Morgan selection, Heirloom Bicolour Mixed which was a new introduction on special offer at £1.99 for 25 seeds. Despite being neglected for a month while I was on holiday, my plants did well and began flowering in early July before they got very tall. The colours are perfect, a pleasing balance of dark purply blue, white and pink with a strong perfume. They are still flowering amazingly well, I cut at least one posy every day and there are no signs of a let up, they'll definitely be on my seed list again next year. I haven't thought about these sweet flowers in years; our neighbor used to grow them when I was a little girl! Yours are beautiful, and I think they may go on my list for next spring! Love them though I've never attempted to grow them and haven't actually seen any in these parts for a long time. They are lovely and the scent exquisite, Ican still smell them in my memory if you know what I mean. We can grow them here but there's no scent!!! Same with honeysuckle. They all look the same but no scent!! I love sweetpeas and despite them not doing very well here I persevere and plant myself some every year. The more you pick them the more they flower which was fabulous in the Uk I used to have them all over the house, sadly it has not quite worked like that here, but I will continue to plant some every year. Did you enter any in your local show Jenny? I love sweet peas too! Ours didn't do as well this year as in previous years - they have got swamped by the raspberries! We're going to try sewing seeds this autumn rather than in the spring to see if we get better flowers next year. My dad used to plant sweet peas. Your beautiful bouquets have brought a sweet memory to mind.